Both Samuel and Michael very much hope that you enjoy the insights their respective articles give, and if you’re interested in finding out more about their collaborative work, or wish pre order a copy of their album, please follow the below link to the ‘Guitar, The Heart of Spain’ PledgeMusic page. In some of the pledge options, the full concert booklet that the two articles were taken from is available to order. In his seminal work Flamencologia, Anselmo González Climent describes flamenco as an intuitive metaphysics, an embodiment of the fundamentals of human expression and a musical manifestation of what the philosopher Miguel de Unamuno described as “the tragic sense of life”. In this description, Climent encapsulates perfectly the essence of flamenco performance: the primal cry of the singer, the dramatic movements of the dancer, the passion and virtuosity of the guitarist and, above all, the way in which flamenco can transport both audience and performer to another world. In short, flamenco contains an earthiness, primal draw and a capability to tap into feelings and emotions that are as universal as they are profound. Because of this, flamenco performers are able to connect with global audiences regardless of their cultural background. However, many who attend modern flamenco concerts are unfamiliar with where this compelling art form came from. Where did Flamenco come from? Flamenco is a music and dance tradition that originated in Andalucía, a region of southern Spain divided into eight provinces: Sevilla, Cádiz, Córdoba, Málaga, Granada, Huelva, Jaén and Almería. Its development is a direct result of the many cultures and communities that passed through and settled in Andalucía throughout the past 3,000 years. These include: Jewish communities, Greeks, Carthaginians, Romans, Vandals, Visigoths, Moors and Gypsys. Each brought their own distinctive art, music, literature and dance traditions to Andalucía and, over the centuries, these merged and intermingled to create new traditions. This process of amalgamation, together with Latin American influences from the New World and pre-existing Andalucían folk traditions ultimately helped to lay the foundations upon which flamenco has been built. It is said that the Gypsies of Andalucía (Gitanos) first gave voice to flamenco, but when considering this, one most not loose sight of the wider cultural picture. From the 15th century onwards Gypsy communities existed in many regions of Spain. However, it was exclusively in Andalucía that flamenco emerged. 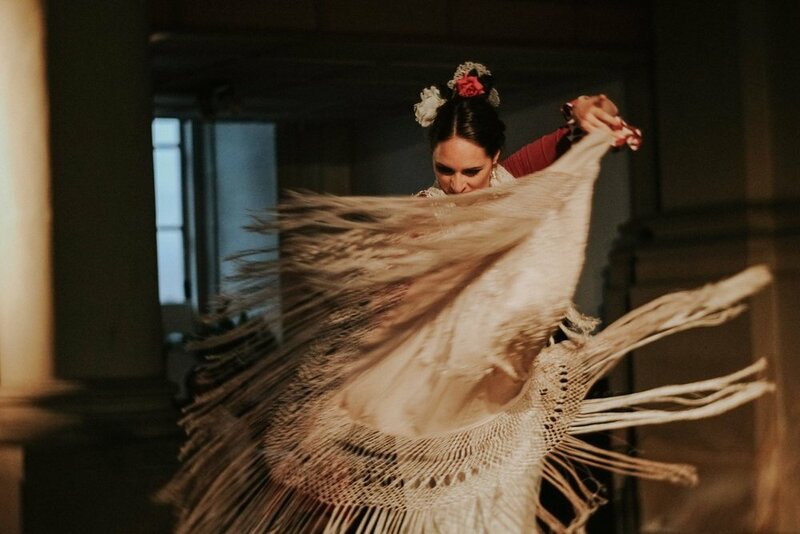 This suggests that the region itself, and its rich artistic culture, informed by: Moorish, Christian, Judaic and North African influences, was equally important to shaping the birth of flamenco. The flamenco tradition started to emerge somewhere between the 15th and 18th centuries. There is a degree of uncertainty as to when it came into being as there is little literary reference to it until the 19th Century. Alongside this, early flamenco practitioners tended to pass the tradition down orally and as a result, until the emergence of flamenco tutorial books in the late 20th Century, no written scores existed. Despite this scarcity of primary sources, what is known of early flamenco is this: it was an art form born from the lives of poor, marginalised Andalucían communities as a necessary expression of the deep emotions they were feeling: joy, sorrow, passion and despair. It evolved as the music of ordinary people who shared their feelings by singing together as they worked in the fields, in the blacksmith’s forge and whilst taking refuge from the hardships of their lives by enjoying what little leisure time they had. Initially, flamenco was primarily a vocal tradition with singing commonly accompanied by hand clapping or the percussive use of work tools, such as the tapping of the blacksmith’s hammer. From these humble origins the tradition evolved until it possessed three principal performance components: singing (cante), guitar playing (toque), and dance (baile). Alongside this, a multi-layered clapping technique (palmas) also developed. Up until the 19th Century, flamenco was almost exclusively practiced within small, closed communities. However, most probably through word of mouth, it later began to emerge and capture the attention of the wider Spanish public. Eventually, staged performances started to take place in music venues known as Café Cantantes and over time, the popularity of flamenco grew so that by the 21st Century, it had become a global phenomenon. The emergence of flamenco from its regional roots to the wider Spanish public and later the World is a story of great complexity and controversy. As such, it has not been fully explored within this short article. However, one controversy that is worth mentioning is this. Some developments within flamenco since the 1970s have proven particularly controversial amongst aficionados. Most notably, the introduction of artistic influences that fall outside the standard parameters of the tradition. While some believe such influences have been positive ‘innovations’, others have seen them as a ‘commercialisation’ and ‘dilution’ of ‘authentic’ flamenco traditions. It is not the place of the author of this article to offer his own opinion, but ultimately, it is worth considering that there is a degree of truth to both sides of this debate. While dance is probably the most widely recognised aspect of modern flamenco performance, the voice (canté flamenco) has retained its place as the central element of the tradition. Traditionally, the role of the guitar was purely to accompany. However, in addition to its accompanying role, the flamenco guitar also started to become a respected solo instrument in the 20th Century. This transition is largely due to innovations brought about by master flamenco guitarists, such as: Ramón Montoya (1880-1949), Niño Ricardo (1904-1972), Sabicas (1912-1990) and Paco de Lucía (1947-2014).